Firefighters from East Sussex Fire and Rescue Service dampen down the flames following a large fire on the pier in Eastbourne. 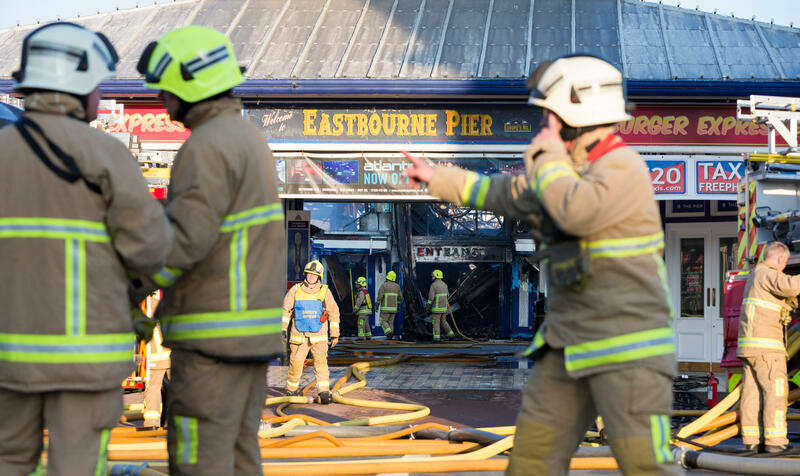 telent, a leading technology and network services company, has announced it is carrying out a digital transformation programme for East Sussex Fire and Rescue Service (ESFRS), increasing operational efficiency and reducing the time and cost spent on admin tasks. The ongoing ICT Managed Service project, which is covered by a seven-year contract worth around £8.3m, has already seen the successful deployment of a cloud-based infrastructure, with consolidation of the existing IT infrastructure to the cloud continuing. Utilising in-house technical expertise, combined with long-term technology partner relationships and experience working with emergency services customers, telent is upgrading Microsoft Dynamics Customer Relationship Management (CRM) software. This will enable the automation of paper-based processes relating to business and community safety visits and improve digital workflows. In addition, telent is undertaking an upgrade of the infrastructure hosting Firewatch ERP, HR, retained pay and resource management system. In the future, a new performance management solution will automate a broad range of operational reporting against FRS targets.